Laura Long is an inspirational singing teacher in London, offering one to one singing lessons, tailored to each persons needs. Having studied with world class voice instructors, Laura uses exercises that understand and develop the natural sound of each persons voice. If you're looking for a professional, yet approachable and easy to work with singing teacher in London, why not get in touch with Laura and book yourself in for a lesson? 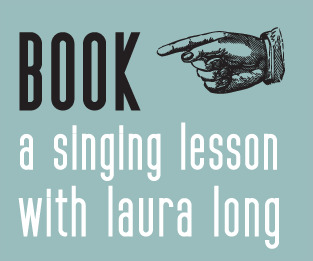 Laura Long offers singing lessons from her studio located in Belsize Park, London, which cover all genres of music, with both cover and original songs. Whether you're an experienced vocalist who is perhaps looking to change from classical to contemporary or perhaps relatively new to singing and want to find your space as a unique vocalist but need a little help to do so, Laura is one of the most experienced and pleasant to work with singing teachers in London. Laura sees every lesson very much as a 'partnership' and offers some of the most relaxed yet productive singing lessons in London. Whether you're a signed artist or simply sing for fun, Laura is here to help build on your vocal abilities and work on every aspect of your singing.